Howdy. Sari’s slower, lazier half here – reporting from the comfort of my couch. Here’s the latest on the race in Tasmania (from what I can glean online, half a world away). From there, teams were supposed to do a waterfall rappel, but it sounds like that section was cancelled. Then, the course gets really strange. Apparently each four-person team has to squeeze into one, two-person inflatable kayak for an 8km paddle. Why, I don’t know. After that unnecessary bonding experience, the teams have a 20km paddle in their own plastic kayaks to a transition area at the end of Lake Mackintosh. If you’ve been watching the GPS tracking or the leaderboard, you’ve noticed that Team Seagate took a commanding lead early in the race. Seagate is made up of a bunch of legends in the adventure racing world so it’s no surprise they’re in front. Team Buff fell back to 10th place after their shooting penalty, but the latest GPS data has them in fourth place less than two hours behind the leaders. The top three teams (Seagate, Silva and Blackheart) will all be tough to beat, but keep in mind the race is less than half over. 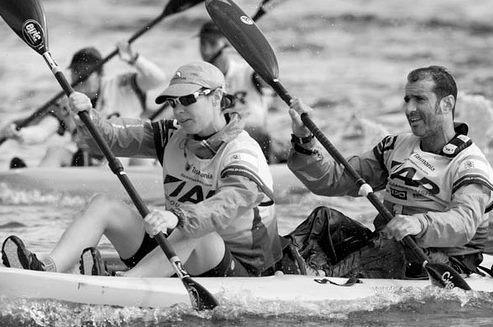 After this paddling leg, teams have a 105km mountain bike, followed by mandatory six-hour rest zone. Then there’s a 65k trek, a 150km mountain bike and a 75km paddle. The race is still anyone’s game. Thanks for reading and for cheering on Sari!